This article discusses the recent Australian Law Reform Commission report proposing a fair use defence to copyright infringement in Australia. It examines the experience of fair use cases in the United States and draws three lessons from the jurisprudential history. First, it suggests that decisions in fair use can only really be understood within a theoretical framework, and that unless we import that framework into Australia any fair use defence will not work as expected. Secondly, the article argues that the area where fair use jurisprudence appears to be most helpful, in dealing with “transformative” works, is actually much more limited than outsiders to the US would expect. And finally, it suggests that any implementation of a factor related to market substitution should take account of the gaming of the system that has gone on in the US. The interaction between copyright law and media policy is an area of considerable difficulty. This article analyses and contextualises the conclusions of the Australian Law Reform Commission regarding the retransmission scheme and assorted broadcast exceptions. It queries the trend towards treating broadcast as “just another copyright subject matter”, illustrates the difficulty in understanding copyright policy in isolation from media policy considerations, and raises questions about what is next for the boundary land between copyright and media policy. It argues we should pay more attention to cultural policies in thinking about copyright reform in this space and generally. This article argues that the Australian government should amend the Copyright Act 1968 (Cth) in order to introduce United States-style fair use provisions as an additional open-ended exception to copyright sitting below, and integrated with, the current fair dealing exceptions. It identifies some of the ways in which current copyright law is holding back innovation and economic growth, which emerge from the submissions of some of the key stakeholders to the Australian Law Reform Commission’s recent Inquiry into Copyright and the Digital Economy. It then reviews the experience in the US and how the fair use provisions have spurred innovation in the American economy. The arguments for and against introducing fair use into Australian copyright law are canvassed, and different options for implementing this reform are analysed, including that proposed by the ALRC. The optimal option for reaping the benefits of the digital economy, involving a “two-step test”, is identified and recommended. 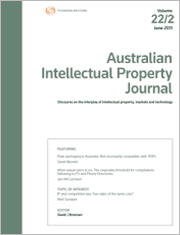 For the pdf version of the table of contents, click here: WAU – AIPJ Vol 24 Pt 4 Contents.